Lemon Harangue Pie: The craziest sport in the world? Most sports are pretty crazy when you think about them, but Bo-Taoshi has to be one of the craziest. It can be found in (where else?) Japan. The game is played predominantly by military cadets, and is essentially a version of capture-the-flag or king-of-the-hill. 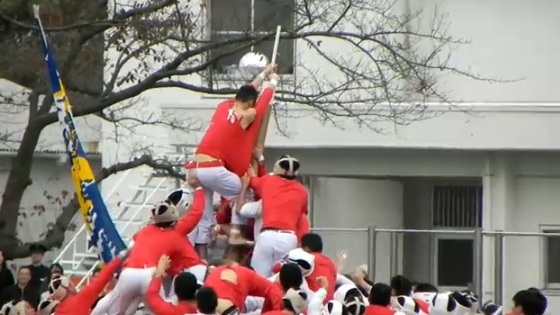 Two teams push, punch, and kick each other for control of a large wooden pole. And that's pretty much all there is to it. Each team is split into two groups of 75 defenders and 75 attackers. The defenders gather around their own pole, while the attackers launch an assault against the opposing team's pole. The first team to pull the pole of the opposing team down to an angle of at least 30 degrees wins. Somehow I doubt this will catch on in the U.S.